Dromma bed is a relatively new bed in a Box bed. The company located in North Carolina went from selling just 3 beds per month to a revenue base of $100000 per month in just three months. This represents a drastic change in sales volume and it’s not hard to figure out why. Apart from being 100% locally fabricated the Dromma bed features more concise and relevant technological modifications using bio-friendly materials. Their design team has been able to sift out the sometimes unnecessary design/technology commonplace in big name brands, making sure that only technology that actually effects significant change in the comfort level of the mattress is incorporated into the mattress, all the while doing it with materials that puts a smile on the face of eco/green activists. Consequent of the exclusion of unnecessary design features Dromma as a company have been able to offer a very competitive price structure to their prospective customers. This review attempts to take a closer look at the Dromma mattress, to determine if its success and popularity as a new start-up are skin deep. The cover of the Dromma bed features an intricately hand sewn fabric whose composition we are not yet familiar with. It turns out that Dromma hasn’t been too loud about the materials it used in tailoring the cover. What we do know is that the cover feels pleasantly soft to touch and boasts of an above average aesthetic appeal. It also houses a circumferential Zipper that facilitates its easy removal if the need be. This adds to convenient if you decide to wash the cover or need an outright replacement (which is available separately in the Dromma store). 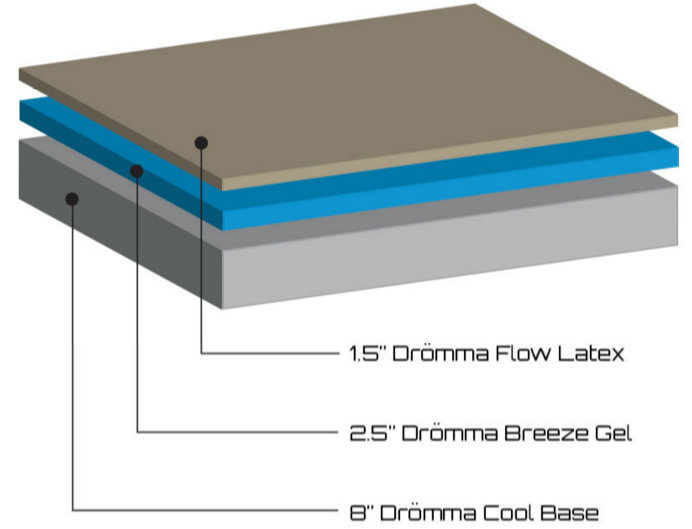 The first layer of the Dromma mattress is fabricated from natural soy based latex foam that measures 1.5 inches. Being a latex foam, this layer is intended to afford the Dromma bed with the needed bounce and responsiveness. Characteristic of latex foams are their convoluted design and intermittent perforations that unlike memory foams aid breathability and promotes the overall cooling of the mattress. The middle layer spots a ‘preserve V’ gel infused memory foam that is 2.5 inches thick. If you are conversant with memory foams, you will know that they offer an incomparable level of comfort by relieving pressure points whilst cushioning the body of the sleeper. You should also know that memory foams have a penchant for retaining heat, a problem Dromma look to solve by infusing the memory foam with gel. The gel acts as a conductor of heat and helps to dissipate heat instead of accumulating it. The third and final layer is an 8-inch foundational layer coined from a highly dense base polyfoam. This layer functions to provide support to both the sleeper and the other constituent mattress layers. In addition, it increases the overall durability and longevity of the mattress by accentuating its structural integrity. In all the layers stack up to a towering 12-inch mattress. This is significantly thick and from the look of the mattress build, factors into the durability potential of the Dromma bed. The dromma bed comes in two firmness categories the medium soft and medium firm. This move of providing differs firmness options is one that is much appreciated by our review team. Why you may ask, well, from experience, we have found that most all in one-bed solutions do not come close to delivering to the needs of the very diverse sleeper categories. on a scale of 1 to 10 where one is very soft and ten is too hard the medium soft version of the Droma beds sits tight at 4. What this means is that this mattress is an excellent choice category for the average sleeper. The mattress would also prove advantageous for individuals with a slim physique. This variant ranks 7 on our firmness scale. This variant was crafted with the meet the needs of sleepers who desire a firmer mattress that provides adequate supports and discriminates against sinking in. Ideally, this would be plus size sleepers as this variant has the necessary thickness to support the higher weight category without sinking in. Consequent of the memory foam housed in this mattress the Dromma bed (especially the medium soft) does an excellent job of contouring around the body of the sleeper. This ensures that your original orientation of your spine is maintained as you sleep, preventing the development of back pains. Even though the mattress has a memory foam layer infamous for their predisposition to accumulate heat the Dromma bed does a fantastic job of sleeping cool. How does it achieve this? 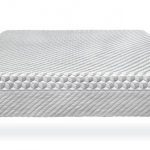 Interlaced within the first latex layer are perforations that enhance the overall breathability of the mattress, working in synergy with the gel infused memory foam the Dromma bed makes certain that sleeping hot is its least concern. Bounce and responsiveness are top-notch; this is expected as the mattress houses a latex foam renowned for their impressive bounce capabilities. This means that if you lead a sexually active life, this mattress will allow you to take creativity to the next level. From our hands-on experience, the only drawback to the Dromma bed was that we noticed a significant degree of motion transfer from our tests. This is consequent of the first latex layer. However, this the increased level of motion transmission is less likely to be a problem especially if you don’t have a sleeping partner. For $549 you can order the twin size of the mattress, a price that is more than competitive for the quality and comfort packed in this mattress. Similar mattresses (save Brooklyn bedding’s mattress) start at a much higher price. Considering that the mattress is also made of bio-sustainable, we are tempted to say that this mattress is too cheap. Dromma also incorporates the exclusively online retail outlet in its marketing approach. The advantages of this method in comparison to brick and mortar sales channel is glaringly apparent in the final cost of the mattress. Dromma offers free shipping to all states in continental US, and the delivery usually takes 3 to 5 days. For sceptical customers, Dromma provides an extended 200 night’s trial period to verify that the Dromma bed is worth its onions. For approximately six months, users can return the Dromma bed for a full refund inclusive of shipping costs. Again most mattresses at this price category can only boast of a 100-day return policy. For us, this shows that Dromma is confident about their product, as a return policy of 200 days is one we only see in the top guns of the mattress industry. The warranty coverage for the Dromma bed extends for 12 years. While this is not the impressive 20-year warranty offered by some market leaders it is well above the ten year warranty coverage that runs rampant with mattresses in its price class. For this 12 year period, Dromma will repair or replace the mattress if the user experiences any deterioration consequent of poor craftsmanship. However, the warranty only holds true if the user adheres to Dromma’s warranty policy enumerated here. Dromma as a start-up rank C in our company reputation charts. However, it is apparent that if they keep on with the level of quality and comfort provided by their mattress, it’s only a matter of time before they develop a brand image as one of the more reputable mattress making company. Apart from being an entirely US production affair, Dromma makes sure that returned mattresses are donated to charity. The medium firm variant of the mattress provides the necessary pressure relief and cushioning effect that meets the needs of side sleepers. Apart from being a darling to environmental activists, the biobased natural memory foam demonstrates almost null off-gassing. A phenomenon guaranteed to offset individuals with allergy problems. Many mattresses attempt to find the delicate spot between competitive pricing and quality, very few have been able to find the sweet spot. The Drommo bed is one of such, by being more practical with its problem-solving designs Drommo has been able to cost the price of this excellent mattress significantly. Aside from the less significant issue of little motion transfer, this mattress offers one of the best deals in the mattress making industry, and if its specs meet your specification, it is one mattress you should consider highly in your mattress buying decision.